JJ is charged with the murder of Deimos. What's happening on NBC soap opera Days of our Lives during the week of July 3-7, 2017? Check out the day-to-day spoilers and a sneak peek video below to find out. JJ is charged with murder; Sonny is startled by a memory; Jennifer pleads with Chad to stop her daughter from marrying Dario; Dario asks Abigail to marry him. Chad and Gabi become surprise witnesses to Abigail and Dario's last-minute wedding; Nicole is caught in a lie; Joey makes a confession to Tripp about Ava; Tripp makes trouble for Kayla. Kayla finds herself in hot water at work; Rafe plans a surprise for Hope; Claire tells Theo she wants to get back together; Maggie advises Theo about his future. Rafe is thrown by Hope's response to his big question; Marlena hypnotizes Lani, hoping to trigger Lani's memories of the night of Deimos's murder; Sonny confesses to Paul; Eric and Nicole start to remember key moments from the night of the party. 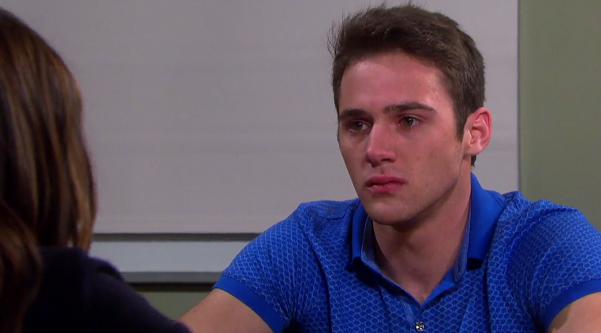 Sonny is faced with a tough decision; Gabi and Chad try to reconnect; Gabi supports JJ during his ordeal; Lucas confronts Kate about her marriage to Andre.